The most common question people that snore always seem to ask is; how can I stop snoring? It is very understandable though as snoring can be both a nuisance and a health risk. There are in fact several things that you could do and try, that could actually help with your snoring, and this article will hopefully show you how to stop snoring no matter how severe it may be. Many of the steps to try are lifestyle changes, which amazingly are very effective. Before I discuss ways to stop or reduce snoring, I think it is important to refresh your memory and briefly explain; what snoring is. When air is restricted through the nose and mouth because your airways narrow, snoring will likely occur. The muscles of your throat relax when you sleep, and your throat becomes naturally constricted. The more constricted or narrow the airway, the greater the vibration will be. The vibration of the soft palate and other tissues in the mouth, nose and throat, will create a sound known as snoring. So, what is the cause of snoring? Snoring can be caused by several factors, which includes the following: being overweight, a blocked nose, allergies, sinuses, excessive alcohol consumption, excessive smoking, wrong sleeping position, mouth breathers, and the anatomy of your mouth. The above paragraph was just a brief summary of the causes of snoring, if you need more detail, please read my article on the subject. What is causing your snoring? What type of snorer are you? You cannot learn how to stop snoring or even alleviate it, if you cannot answer this question. The point is; I can mention 300 solutions or snoring cures, if you don’t know what is causing your snoring, or at least have an idea, we are not going to get far. For example: one way to stop or reduce snoring is to stop or reduce smoking, but if you are not a smoker this cure is not relevant to you because smoking is not the cause of your snoring. It is therefore important to try and pinpoint what type of snorer you are, what causes you’re snoring, and then with that information you can find out how to stop snoring in your situation. Related reading: Different types of snoring. So, does your snoring sound come from the nose, the back of the throat, or does it start from the back of the tongue or do you have sleep apnea? You might also snore in more than one way, which can also happen. 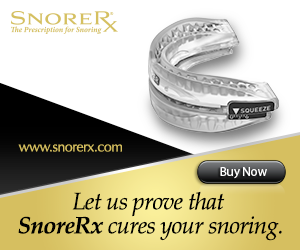 As long as you have an idea about the type of snorer you are, you are getting closer to a solution. Now you need to look at the general causes of snoring and figure out if any of the causes could be relevant to you. Do you have often bouts of allergies or sinuses or anything that causes you to have a chronic blocked nose? Are you a mouth breather? Etc, Etc. These are the types of questions you should ask yourself, and then when you answer yes to any of the causes; you find a cure for it and you find out how to stop snoring. There are proven ways to stop those rumblings at night, with the most of these just being simple lifestyle or behavior changes that can make a huge difference. When you read this you might ask; really is there not more to it, surely learning how to stop snoring should be more complicated than this? No, that is all there is to it. Making simple behavior changes can make a huge difference to your snoring, there are also several proven stop snoring devices on the market that can also help. To stop snoring you can choose to make lifestyle changes or purchase one of the many stop snoring devices, or you may even choose to make lifestyle changes and buy a stop snoring device at the same time, for double impact. There are even some alternative ways to stop snoring, such as playing the didgeridoo, hypnosis, and singing (not only in the shower). You can find a comprehensive list of products on this site under the store section and drop down menu ‘All Products’, where you will also find items with brief reviews. Also read my full review of an excellent product called Good Morning Snore Solution, it is worth a read. How to stop snoring is not a difficult question, and the following behavior or lifestyle changes are recommended either in isolation or in conjunction with a stop snoring device. You get rudely awaken in the middle of the night with a painful elbow shot in your ribs followed by these words from your, what sounds like, ticked off partner; “TURN ON YOUR SIDE”. You are groggy but you comply, while you softly utter the word “sorry”. For some one who snores this is an all too familiar scenario. If you can however learn to sleep on your side, you can reduce your snoring tremendously. When you sleep on your back your tongue can relax so much that it collapses to the back wall of your throat. Your airways will therefore narrow, which will lead to snoring. Sleeping on your stomach, on the other hand, can lead to back and neck problems. It is therefore advisable to get in the habit of sleeping on your side. To help you, you can place a firm pillow behind your back or tie a tennis ball to the back of your pajamas. This will stop you from rolling over to your back in the middle of the night. Losing weight can be an effective way to reduce snoring naturally. You can check your BMI figure on the right of the screen, to determine how much you need to lose. If you have excess fat around the neck area, it is more than likely that losing that fat can stop or at least reduce you’re snoring, because fat around the neck mostly leads to airway collapse and snoring. You should also be aware that although weight is a cause of snoring, people who are not overweight also snores. It is therefore possible that you can have more than one or another cause for your snoring. “What about a night cap?” How many times have you said or heard those words? That last drink just before you go to sleep can actually be causing your snoring. Alcohol and sleeping pills relaxes the throat muscles, which then narrows the airway and will cause you to snore. Avoiding the in-take of alcohol at least 2 hours before going to sleep can help to stop snoring. Also try to limit your use of sedatives, such as sleeping pills. Related reading: Best Sleeping Pills – To make you snore. Do you have allergies that could be causing your nose to be chronically blocked, which then causes your snoring? If you suspect you might have allergies, get yourself checked out by a Doctor or an allergist. You may need to keep your surroundings clean of all the irritants that may be causing your allergies, such as dust, dust mites, and pet hairs etc. A nasal clip or strip may also be helpful, to keep your nose open, which can then stop you’re snoring. Read my review of an effective nasal clip called Airmax Anti Snore Nasal Clip. It has been proven in several studies that smoking causes snoring. Smoking causes upper airway irritation, which leads to airway blockage, which leads to snoring. Smoking just before bedtime can even lead to sleep apnea over time. It is therefore very important that, not only because it is beneficial to your snoring, but also because it is beneficial to your general health, that you stop smoking as soon as possible. Another natural way how to stop snoring is to get in a sleep routine. Your body and mind need enough sleep to recuperate, because of the amount of stress and the rush of the modern era. Go to bed at the same time and wake up at the same time. Make sure your room is dark enough. Make sure that by the time you go to bed, you are relaxed and not still thinking of that lost business deal. I discussed the issue of getting enough sleep in a previous article, called How to reduce snoring, which might be a good idea for you to read. If your nose is chronically blocked at night, you will likely snore, because you cannot breath properly. Nasal stuffiness could be because of more reasons than just allergies, but could be because of nasal polyps, large tonsils, adenoids, expanded soft palate, and deviated septum. Surgery may be required in some of these cases, but a good alternative is to use a nasal clip or nasal strip as explained in allergies above. Do not neglect seeing a Doctor in these instances, because although you are using, or are considering using a stop snoring device, a medical examination is still very important. People that breath through their mouth more than through their nose are more likely to snore, as the snoring sound most often originates from the vibration of the soft palate and the uvula, located in the back of the mouth. This brings me back to my question above, what type of snorer are you? Like I just said, if you breath through your mouth you will likely snore. So, stop breathing through your mouth. A stop snoring jaw/chin strap might be the solution for you. Again, check my store for the best products on the market. So, how are you going to stop you’re snoring? You start by looking at all possible causes of your snoring and what you can do about each cause. So the best way to know how to stop snoring is to eliminate each possible cause. You can work on a check list, and tick off everything that you either ‘cured’, or that is not relevant to you. There are many stop snoring devices on the market, even stop snoring pillows, that you can try which are proven to work for many other sufferers. Remember to determine the type of snorer you are before considering any product. If however, your snoring does not improve, you should definitely see a medical practitioner for an examination to determine any physical abnormalities as already mentioned, and what course of action you can take. I hope you found the information in this article helpful on how to stop snoring, and that you found a way to control your snoring better. Have you found something that cures or alleviates your snoring? Please let me know below this article, it would definitely help other people.